Webwise.ie / Parents / Get informed / Explainer: What is Yik Yak? What is Yik Yak? Described by TechCrunch as a “hyperlocal anonymous Twitter”, Yik Yak is a service that allows you to get a live feed of what people are saying around you. 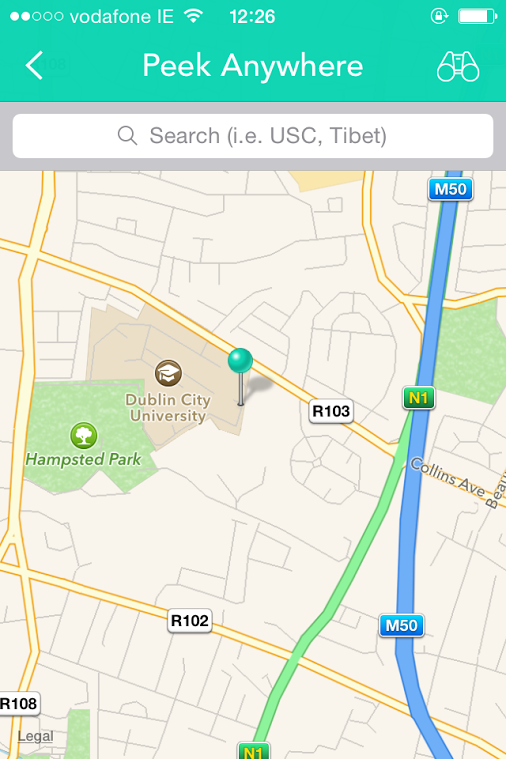 What differentiates Yik Yak from other anonymous messaging apps is that it is location based. The app combines GPS and instant messaging technologies to allow users to share and discover what people are talking about within a 10-mile radius. For this reason the app has become a particularly popular source for news and gossip on college campuses. The Yik Yak app is free to download and is available on iOS and Android smartphones and tablets. Yik Yak was founded by college students, Tyler Droll and Brooks Buffington and launched in November 2013. The app really took off when students began to share the app with new friends they met on spring break. Within seven months the app had been made available on 200 college campuses. In December 2014 the Yik Yak company was valued at more than $350 million. Today the app is popular throughout the US and is beginning to attract interest overseas. To use Yik Yak you need: a compatible Apple or Android smartphone or tablet and an internet connection. Once you download the app you can start reading and posting Yaks almost immediately. Because the app provides for anonymous communications, there is no registration process. Users can’t pick a username, because they don’t have one when using Yik Yak! To post a Yak users simply hit the pen icon in the top right-hand corner and then compose their Yak, in 200 characters or less. Users can sign their Yaks by adding an optional handle. The home tab allows users to see “new” and “hot” Yaks sent within a 10 mile radius of their location. By hitting the up and down arrows, users can decide what messages make the “hot” list. By clicking into a Yak, users can also see the location from which the Yak was sent and can report abusive or invasive Yaks. Popular Yaks can also be shared with friends on other social networks. 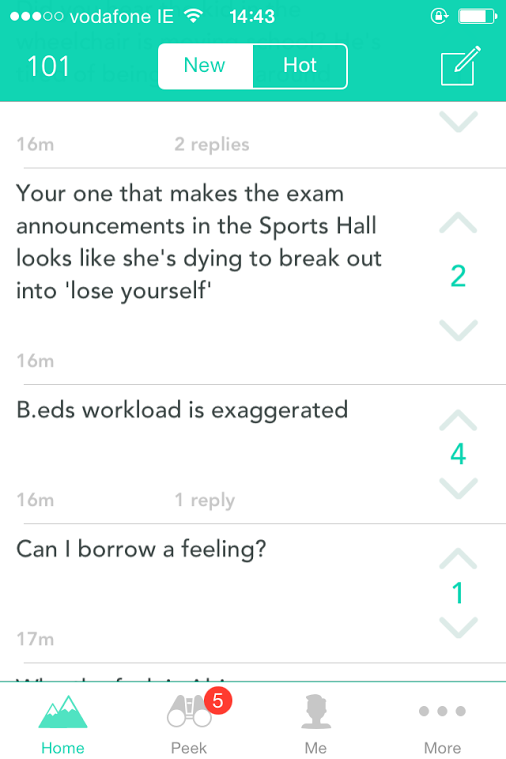 Anonymity: Yik Yak allows you to share your thoughts without revealing your identity. Peek: You can “peek” to find out what people are saying in different locations. This feature allows you to get a sense of how people are reacting to a particular event, such as a concert or sporting event. Though you can read what is being said in different locations, you’ll only be able to write a Yak, vote on Yaks or report Yaks in your own location. Voting: You can upvote your favourite Yaks and downvote Yaks you don’t like. Yaks that receive the most upvotes make up the “hot” stream. If a Yak receives a score of -5, from being downvoted, the Yak is automatically removed from the livestream. Yakarma: Prolific Yik Yak users and those who post the most popular Yaks are rewarded with Yakarma points. This adds a gaming element to use of the app. Your Yakarama score is the number in the top left-hand corner. Commenting: You can respond to Yaks by commenting. Comments are anonymous but users are assigned random icons. Geofencing: To prevent underage users from using the app on school property, second level schools can request to have their school geofenced. Yik Yak terms and conditions specify that users should be at least 18 years of age to use the service. If users are under 18 years of age they must be at least 17 years of age and must get their parent’s/guardian’s permission to use the app. As one of Yik Yak’s key selling points is that it is anonymous, it does not gather users’ names, email addresses or other private information. However, it does record users’ geolocation and app usage. While Yaks are sent anonymously, a person’s location is included. Though Yik Yak allows Yaks to be shared on other social networking services, it does not link one’s Yik Yak account to one’s social media account.